Breakfast is hands-down my favorite meal of the day and I am a huge fan of oatmeal. In the winter I love starting my day with a hot bowl of brown sugar cinnamon oatmeal but tend to fade it out once the weather starts to warm up. It's not pleasant starting your day in a sweat when our Southern humidity hovers around 80+% most days. 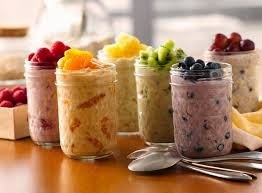 This summer I've gotten hooked on overnight oats. The recipe options are literally endless depending on the assortment of fruit available and I usually make a large enough batch to store several jars in the fridge to grab on the go. 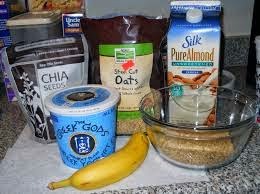 Just be sure not to add the chia seeds until the morning otherwise they tend to get a little slimy.